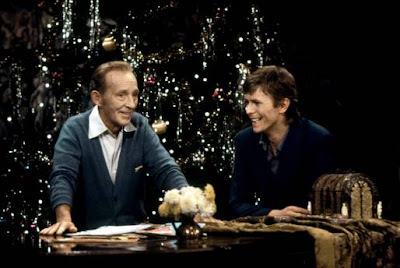 One of my favorite Christmas songs is the late 70s rendition of Little Drummer Boy between Bing Crosby and David Bowie. But I must confess that I didn't know anything about how this strange musical pairing actually came to be. Turns out that it almost never happened, if it weren't for the quick thinking of three songwriters working on Crosby's show at the time. The unlikely duo were filmed performing the song in September 1977, for Crosby's "Merrie Olde Christmas" special that aired later that year. As Crosby was touring in Great Britain and the theme of the special was celebrating Christmas in England, the special's producers felt it made logical sense to ask British stars to make appearances on the show. Two of them who gladly accepted were the model Twiggy and actor Ron Moody, who was starring in Oliver! at the time. But Bowie was a tough sell. The picky rock star didn't like the choice of the song ("Little Drummer Boy") chosen to sing on the program. In fact, he declared that he hated it and asked if there was something else he could sing (ah, ego.) Panicked, the producers/songwriters of the program - Buz Kohan, Larry Grossman, and Ian Fraser - found the nearest piano and banged out "Peace on Earth", the second component of the song, in just over an hour. In the segment, before they sing together, Bowie knocks on Crosby's door, then insults him by asking if he's the new butler! Bowie's idea of "old musicians" at the time is John Lennon and Harry Nilsson. I suppose the banter between Bowie and Crosby is as light and humorous as it can be. Picture someone like Paul Anka trying to have a conversation with Marilyn Manson, and you'll see what I mean. At least Ziggy Stardust left his makeup and costumes at home for this performance. It's actually unclear to this day if Crosby even knew who Bowie was, although one of the song's writers says that Crosby's children surely would've filled him in. The performance aired about a month after Crosby's death, but the song was not forgotten among fans - it circulated as bootlegs until 1982, when it was officially released as a single, and has become a classic. Interestingly, Clay Aiken performed his own duet of the song with the late Crosby on a 2003 Christmas special, but I don't think his voice complimented like Bowie's did. Here's both versions - let me know if you agree. Pretty thing, isn't it? I always thought this pairing was quite interesting. Two extremely different artist coming together to make one timeless song is almost unheard of these days. You can almost sense that they both know how different they are but still have a mutual respect for each other. I hate to admit it, but if Bowie hadn't insisted on singing a part that 'showed off his voice' it probably wouldn't have worked. They compliment each other very well. Hey there. 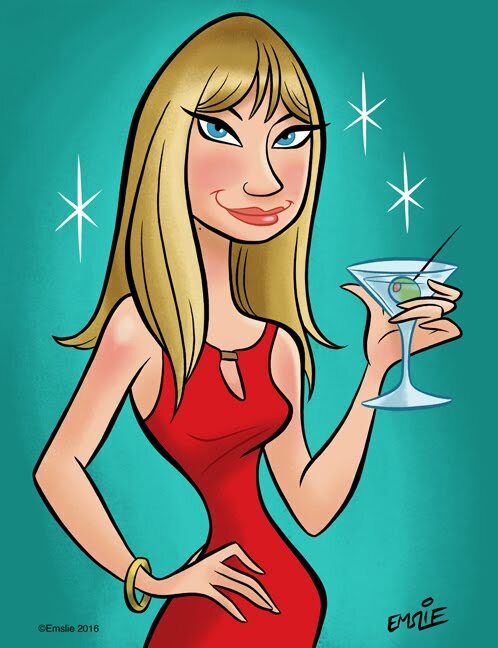 Thanks for stopping by and commenting on my Tuesday post on my Dino Lounge blog. Glad you enjoyed those Sammy ads. If you haven't checked it out yet, I've got my last Christmas post up now. I'll be taking a break until after the New Year rolls in. Take care. Season's Greetings to you and yours! I've always adored their version of Little Drummer Boy! The pairing is totally insane, but somehow it works. It really *shouldn't* work, but it's magnificent. When you look at the kind of music Bowie was doing in 1977 (he was experimenting in electronic music, influenced by bands like Kraftwerk. "Heroes" came out around this time), it's even more incredible! Thanks for reminding me of this bizarre but timeless classic recording! Now THAT's something you don't see everyday! LOL!! Wonderful post! !